Definition of Mozzarella: Mozzarella is a type of cheese. It is a mild white Italian cheese with a springy texture. It is most often used in cooking and eaten melted on other foods like pizza, pasta, and nachos. Mozzarella cheese is traditionally made from the milk of the water buffalo, though there exist varying qualities of mozzarella made from cow’s milk. 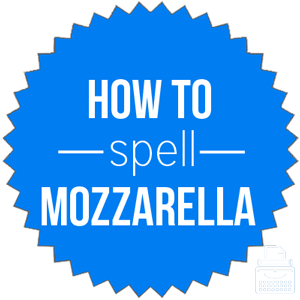 Pronunciation of Mozzarella: Mozzarella is pronounced mots-a-rell-a. What does mozzarella mean? Mozzarella is a noun. It is a white Italian cheese with a mild flavor and a smooth, rubbery texture. Often called mozzarella cheese, it is unsalted and unripened. It is commonly shredded and put on pizza. Since I am a vegetarian, I always order the three cheese pizza that comes with mozzarella, cheddar, and Monterey jack cheese. During our trip to Italy, we indulged in all sorts of cheeses but my favorite was the mozzarella that was made fresh daily. There are no common phrases or idioms that use the word mozzarella. However, there are a number of dishes that use the word, or a shortened form of the word – mozza – in their names. According to Merriam-Webster’s, mozzarella was first used in the year 1911. The word mozzarella comes from Italian; the diminutive of mozza, meaning a cut or type of cheese, from mozzare, meaning to cut off, which comes from mozzo, meaning cut off or docked. Ultimately, it comes from the Vulgar Latin word, mutius, which was altered from the Latin word mutilus. The word mozzarella is a specific name of a particular type of cheese, and thus, has no synonyms. Mozzarella is a type of Italian cheese that is mild in flavor and white in color. There are no synonyms for mozzarella as it is the name of a specific type of food.